”My husband, Ben, felt the land should go into conservancy, because of all the surrounding agricultural lands, and because of the ecological diversity it represents, with all the birds and wildlife. It was Ben’s retreat, a place where he found peace and contentment with nature. This protected forest stand is surrounded by agricultural fields in the neighbouring properties. The property provides important habitat for wildlife species in the area and also serves as a stepping stone in a wildlife corridor. This natural area is a large stand of deciduous forest, dominated by trembling aspen and balsam poplar, with a rich variety in shrub and forb species. It has a dugout with a number of wetland plant species, and is home of wood frogs, moose, deer, pileated woodpeckers, and a wide variety of songbirds including various flycatcher and sparrow species, and wrens, chickadees, and waxwings. It is located near Manawan Lake, an Important Bird Area, and near other forested quarters, which together form important stepping stones for wildlife travel, as well as for habitat and biodiversity conservation. The surrounding landscape is largely agricultural, with fragments of natural habitat, therefore conservation of this undisturbed forest stand serves to retain and sustain a parcel of native habitat within the landscape. It is also important to local residents for the opportunity to encounter wildlife to experience the serenity of nature. Whether at Boisvert’s Greenwoods, or at your home, take a guided tour using the map below, or click here for the tour booklet. Removed 4.8 kilometres of barbed wire to make the site safer for wildlife. Created a loop trail, entry way and added signage with funds from MEC. 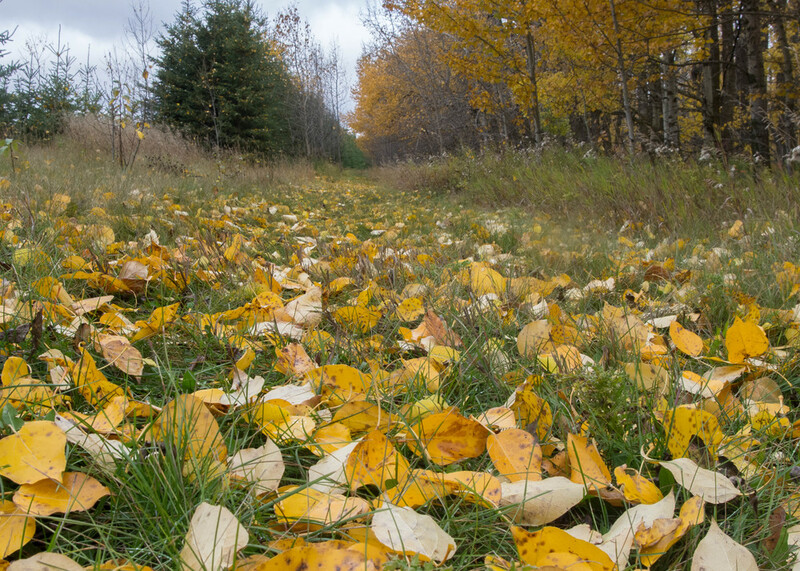 Take a virtual walk at Boisvert's GreenWoods, and then get outdoors and enjoy some fresh air! Solve a puzzle by learning about pollinators to find our newest geocache! Visting just got a little bit easier!